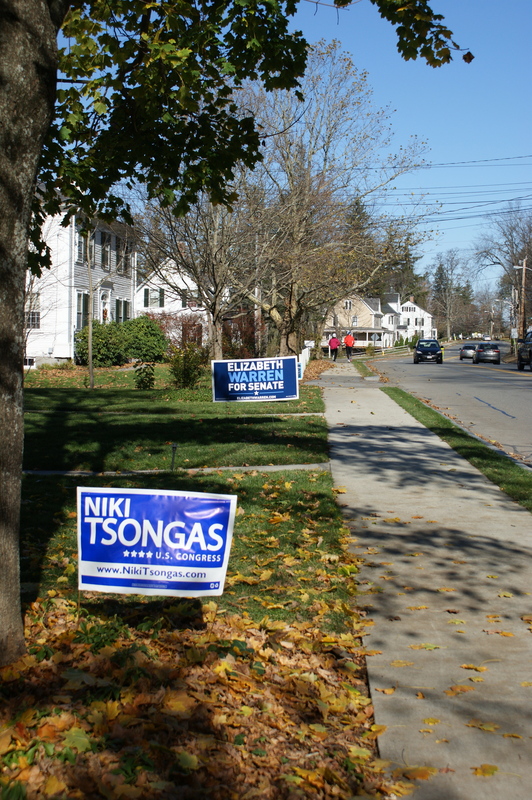 Each Presidential Election year, I take photos of events starting with the primaries and ending with an all day series on election day. 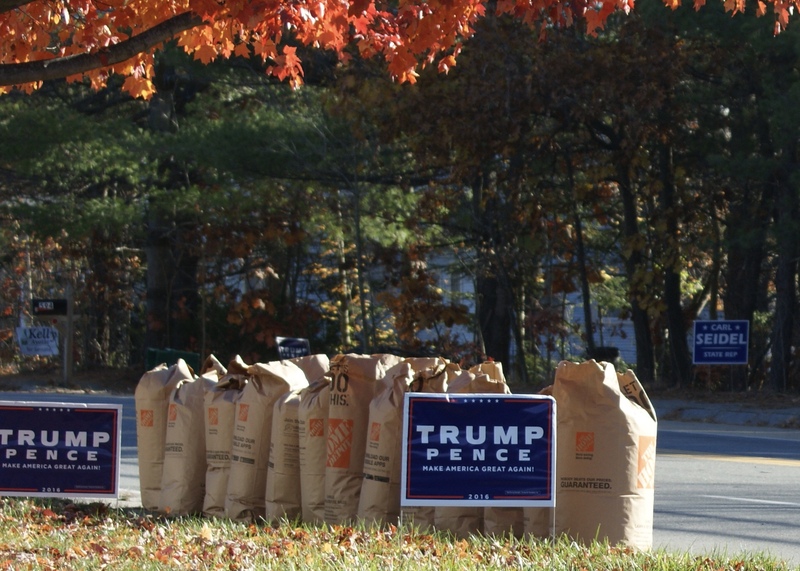 Last year was no different and to mark a full year since the Trump victory, I looked through my Politics photo file and decided to share some of the moments I’ve captured over the years. It kind of evolved into something more. 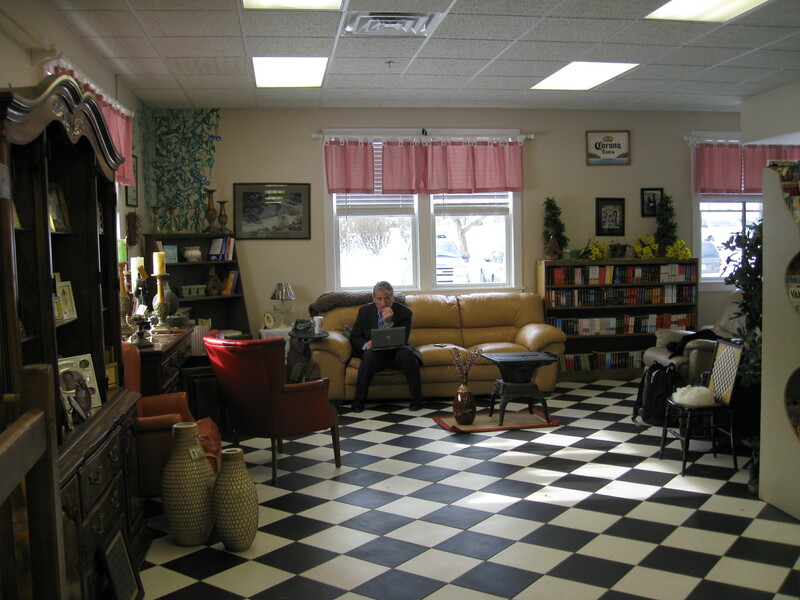 As the pharmacy began to fill up with media and the very few voters who could squeeze in, King would chat with people between writing emails and taking calls on his blackberry – at the time juggling devices like this was still rather extraordinary. 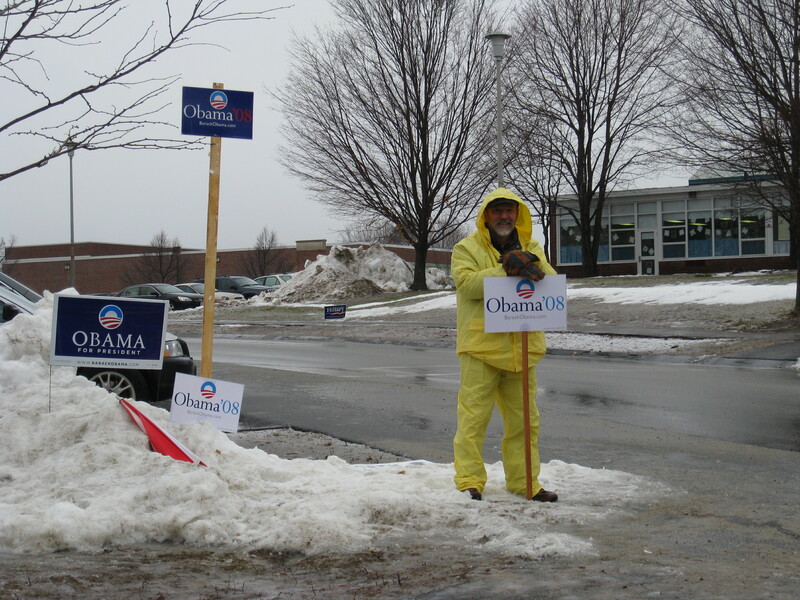 A native of Dorchester, MA, the bitterly cold morning was not bothering him even though he admitted that most days he wasn’t even sure where he was as long as he was on the heels of a candidate. 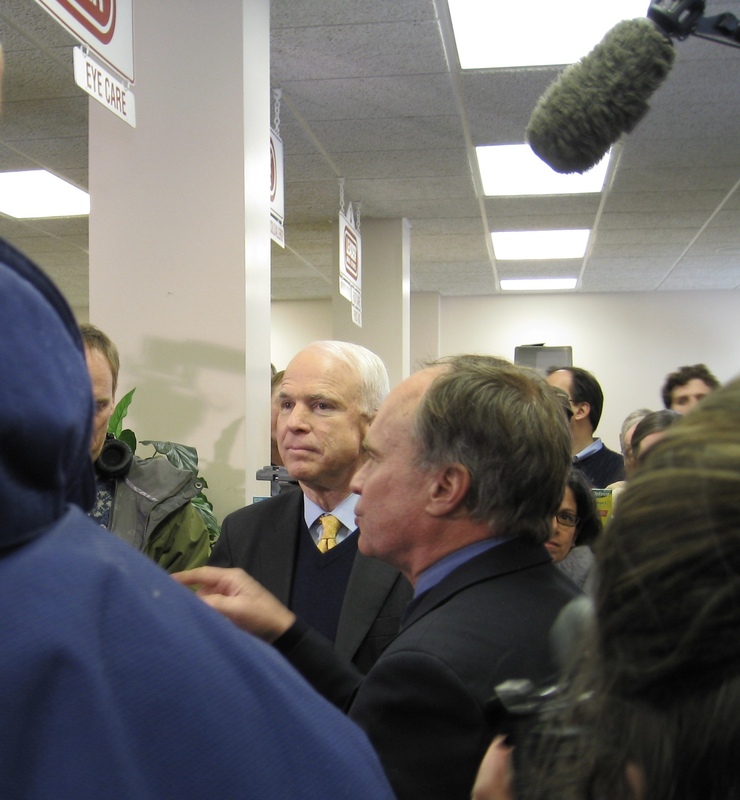 Senator McCain arrived with former Senator Warren Rudman (not pictured here) whose endorsement was announced at this event. He shook hands with the few citizens who were within reach – most had been pushed back into the aisles of band aids and shaving cream behind him. The tiny pharmacy was so jammed that Cindy McCain chose to stay on the bus, and the chaos was intense enough that McCain never again scheduled a campaign appearance at a private business. At the time I thought he looked old and tired, but compared with the man today, he looks positively chipper. 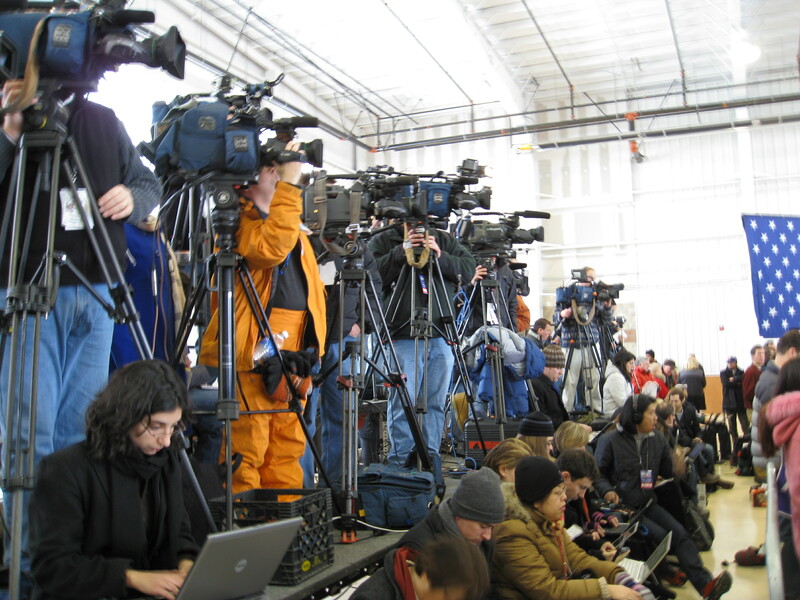 Meanwhile, Senator Hillary Clinton was flying in to speak in a hangar at the Nashua Airport, where there was plenty of room for the media. 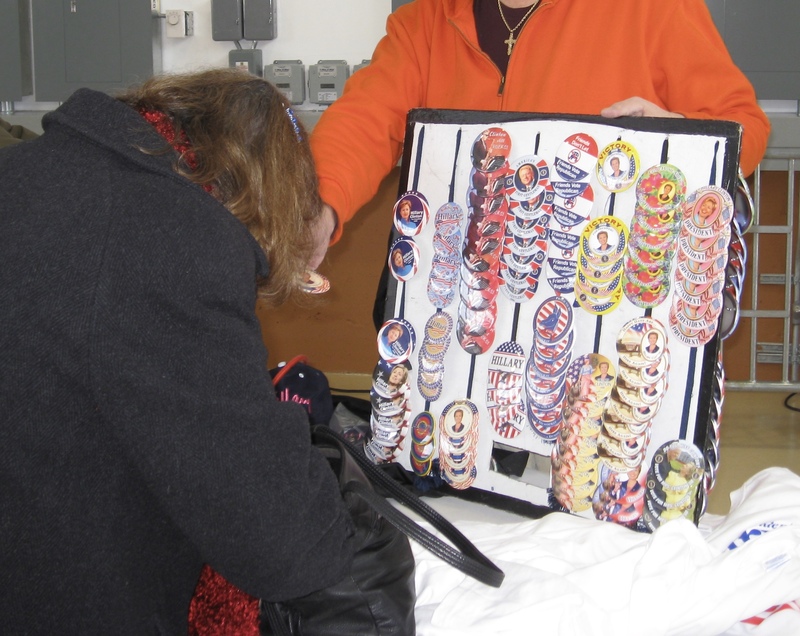 And, unlike McCain, lots of merch. Clinton’s airport event included the unveiling of her new campaign bus, intended to be a counter punch to the straight talk express. 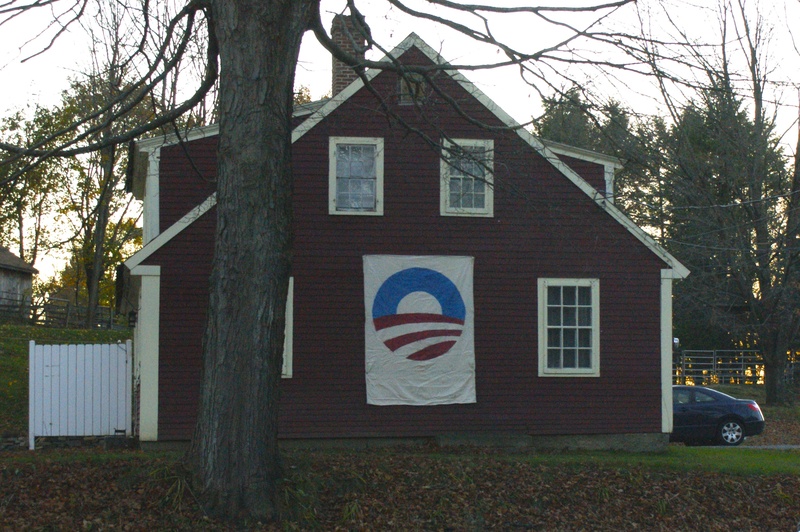 Alas, Obama’s victory was all anyone could talk about. As she got up to speak, the the expressions of former President Bill Clinton and daughter Chelsea pretty much said it all. 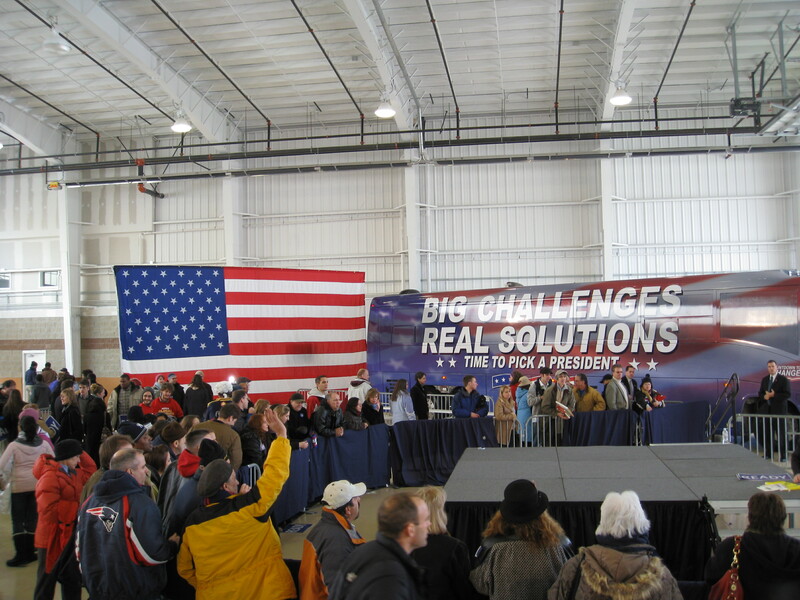 Like the pharmacy, the hangar had more media in it than voters but the campaign was sure to create good optics for the event. 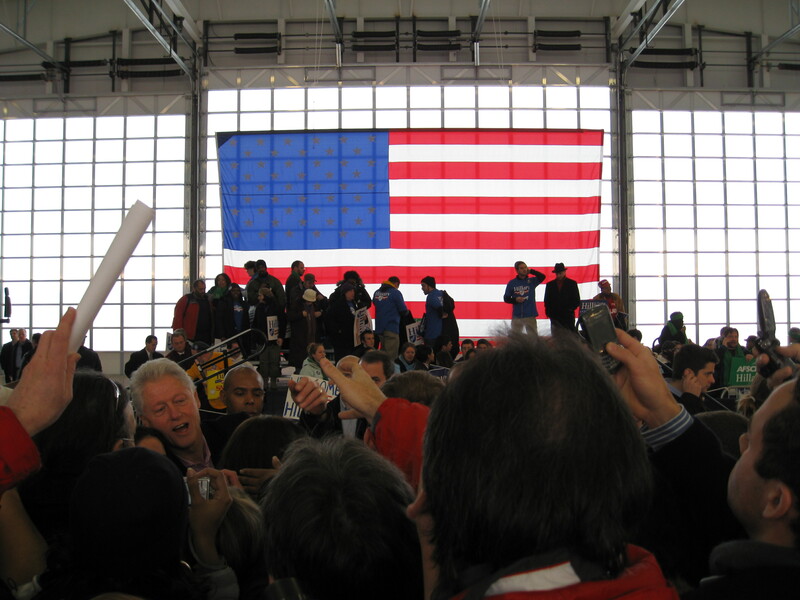 What they didn’t show was Bill working the crowd like he was still the candidate. 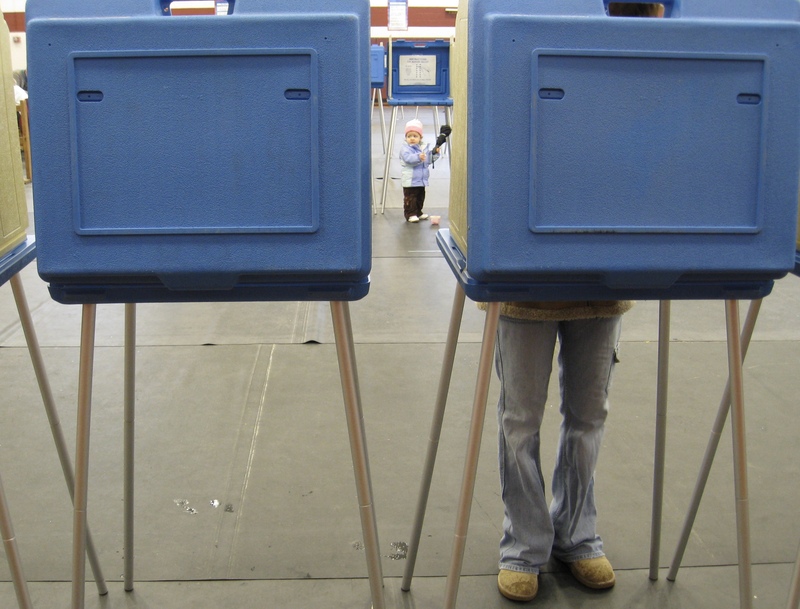 I didn’t take my camera to the polls in November, 2008. 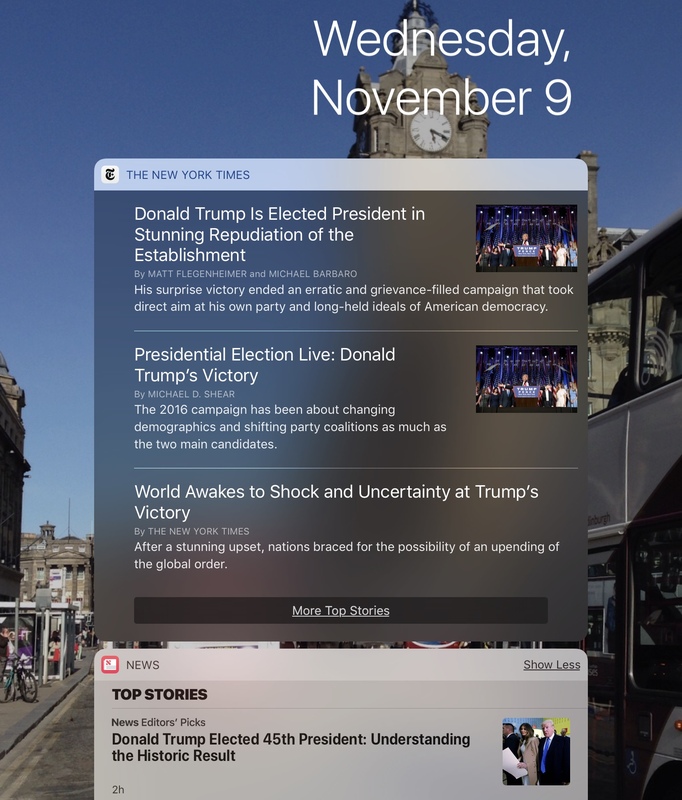 I was preoccupied with other things and also didn’t want to jinx it. I wish I’d thought of that in 2016. 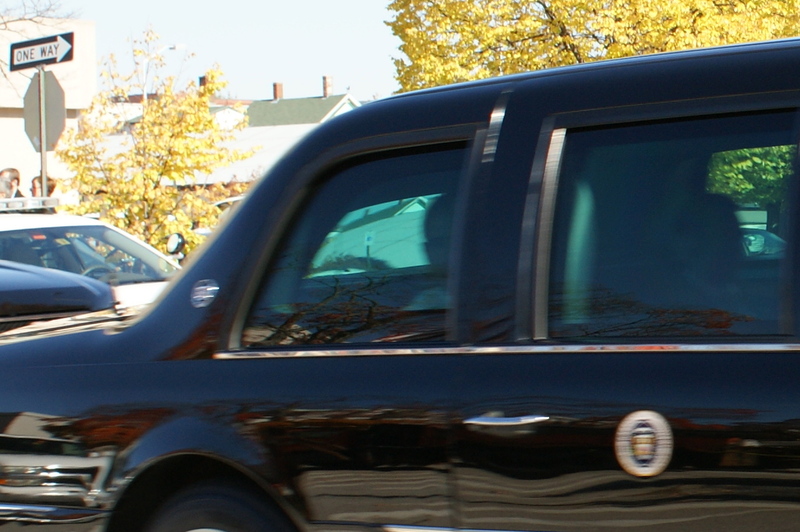 In October 2012, President Obama campaigned in New Hampshire. 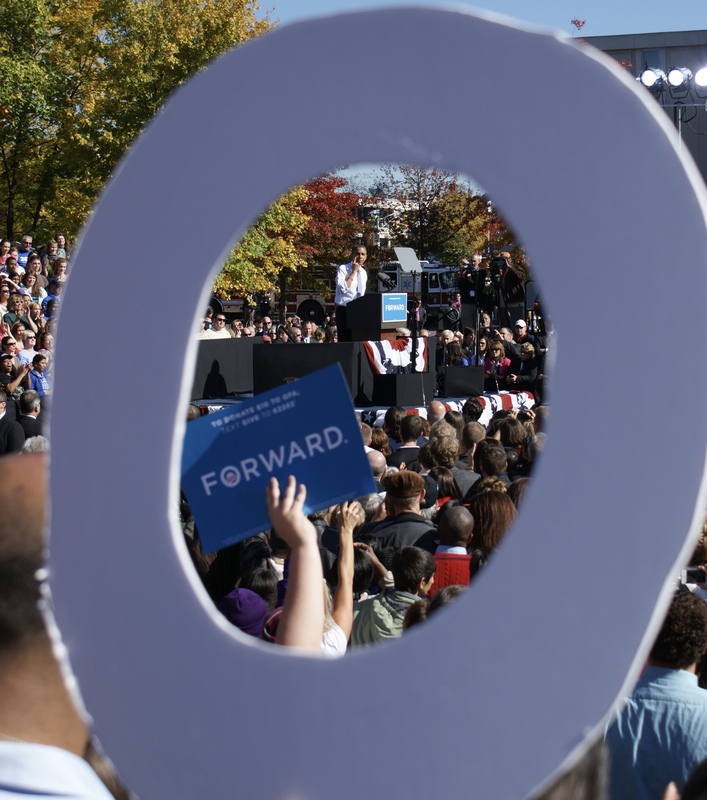 The group of voters on the bleachers in front of us brought giant pieces of foam core cut to spell OBAMA. 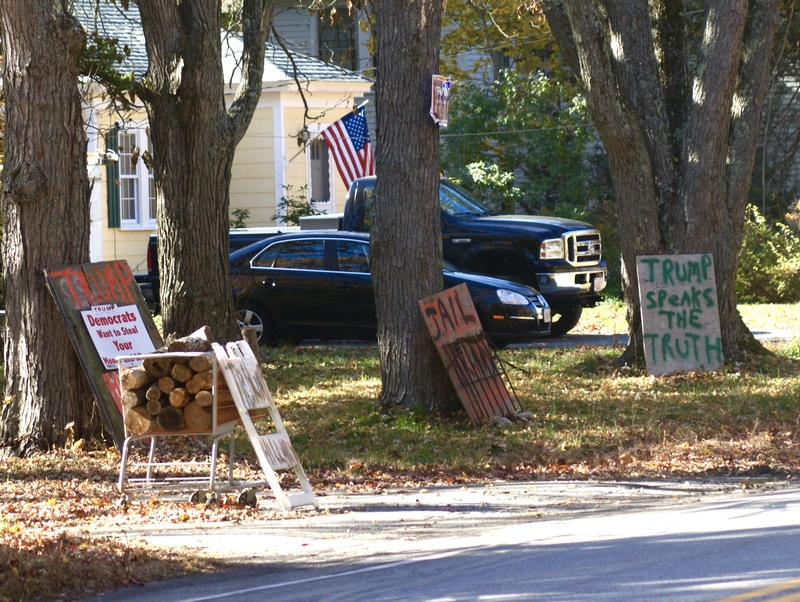 I thought of this home made sign a lot in the fall of 2016, when the side of this house and whole lot of yards were empty. 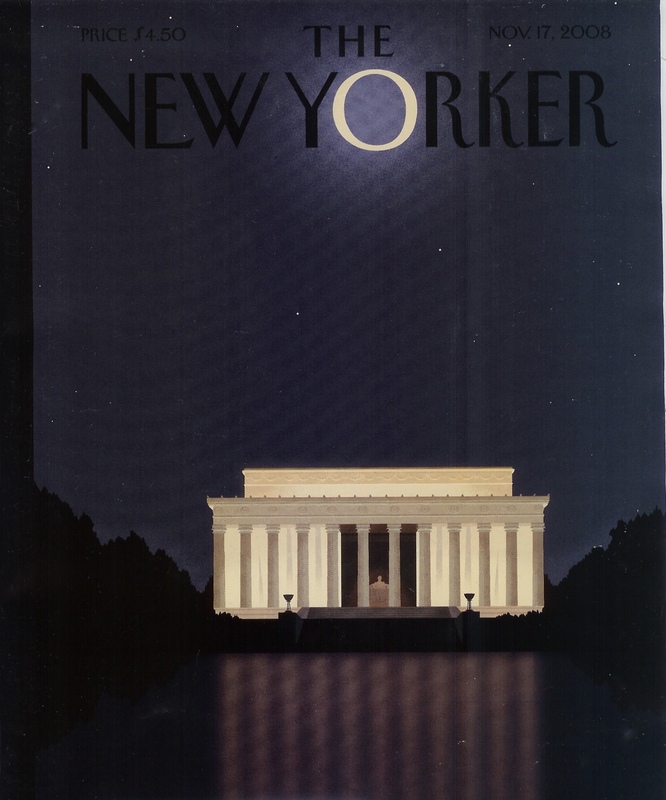 In 2008, the slogan was “Hope.” In 2012, Obama perhaps understood that his path forward would be blocked at every turn by an obstinate and xenophobic Congress. 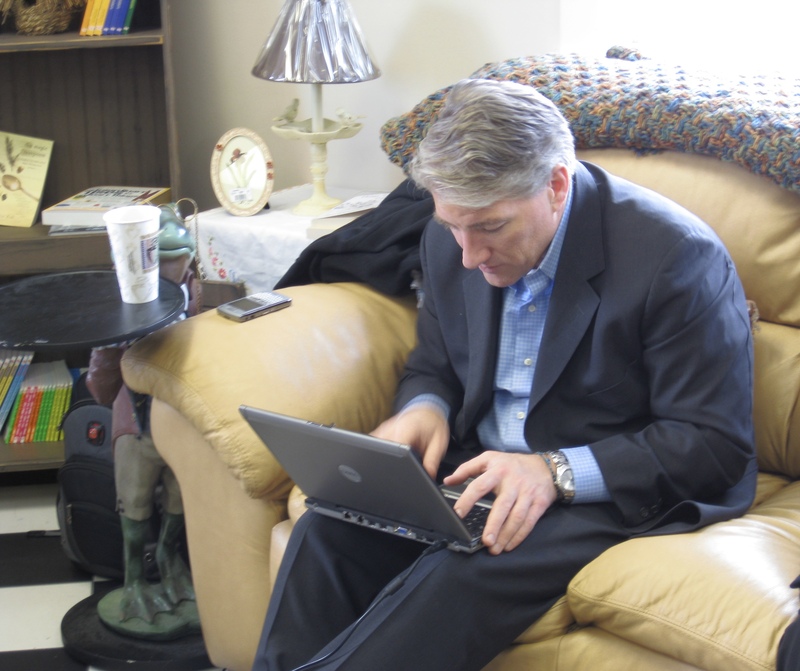 Mitt Romney was undone by a comment about the 57%. How quaint. 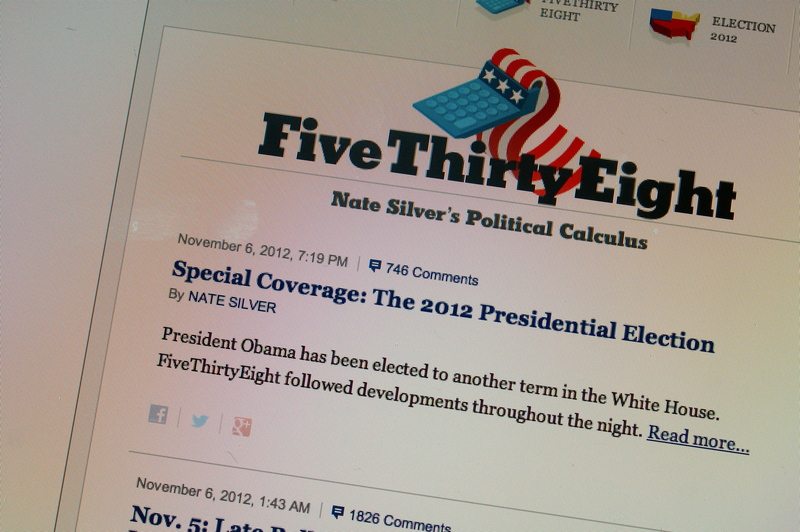 Nate Silver and his Five Thirty Eight statistical analysis first emerged in 2008 and changed the face of political prognosticating for good. 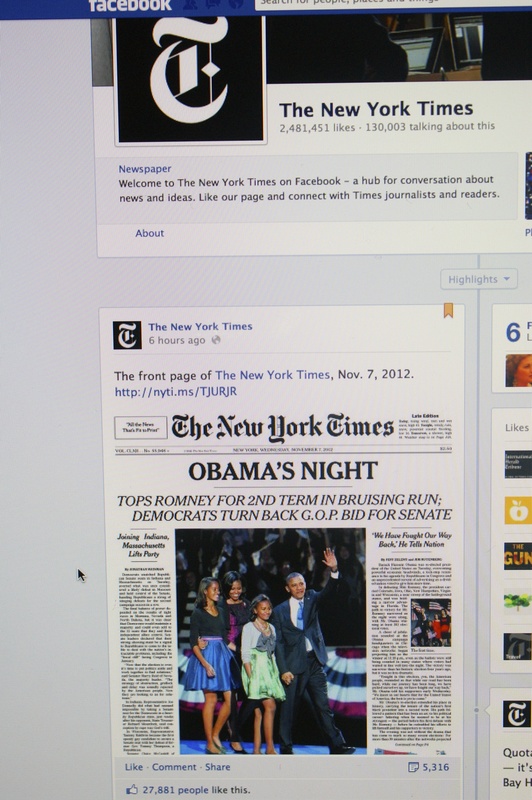 Foreshadowing: For a lot of people, this was as close as they got to the front page of a New York Times – by 2012 more people were getting their news online than ever before, and the influence of Facebook on the electorate in 2016 is a story that is still unfolding. Elizabeth Warren’s victory over Scott Brown proved that, at long last, a woman could win a state-wide election in Massachusetts. Niki Tsongas is giving up her seat in 2018, leaving Veterans without one of their strongest advocates in Congress. It’s a race to watch. 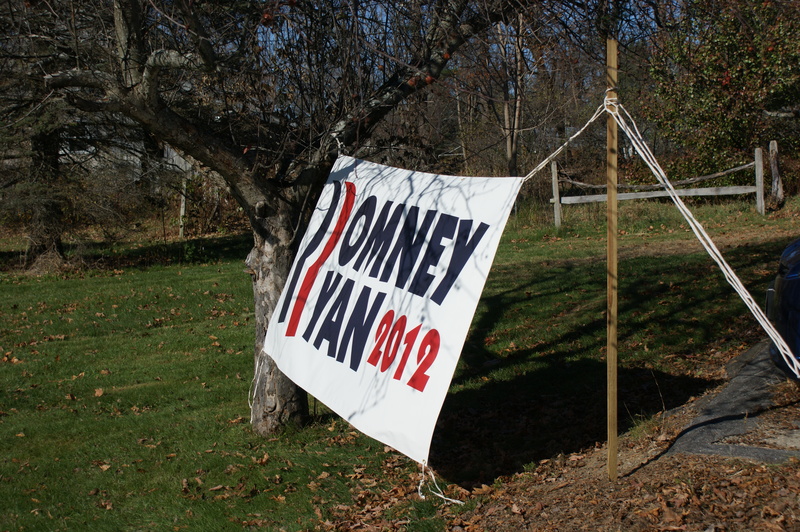 Someone actually had these signs printed up – and we live in a blue state. By the time I took this photo I was starting to get the hint. 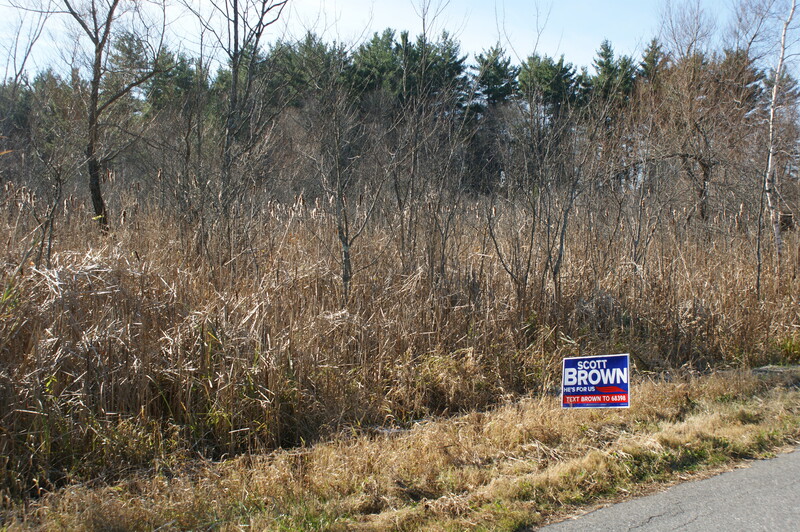 There weren’t nearly as many signs up as in 2008 or 2012. 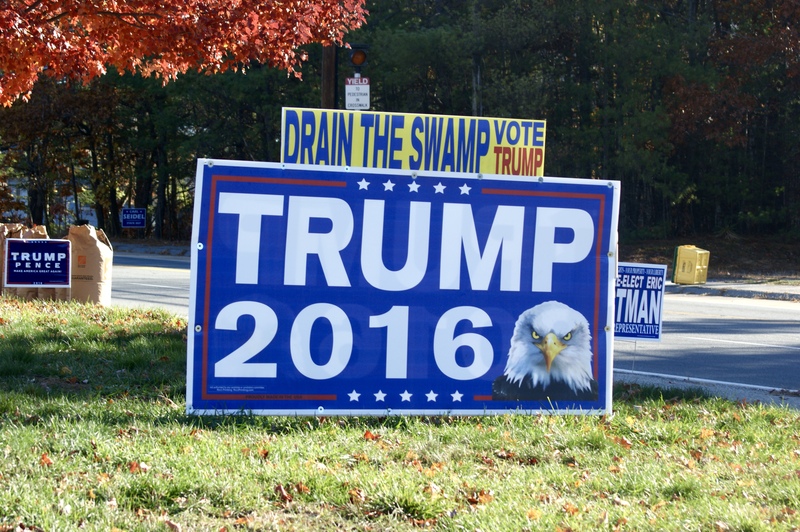 Hillary ultimately won the states in which these signs appeared, but the strength of Trump’s message and how it was delivered could not be denied. 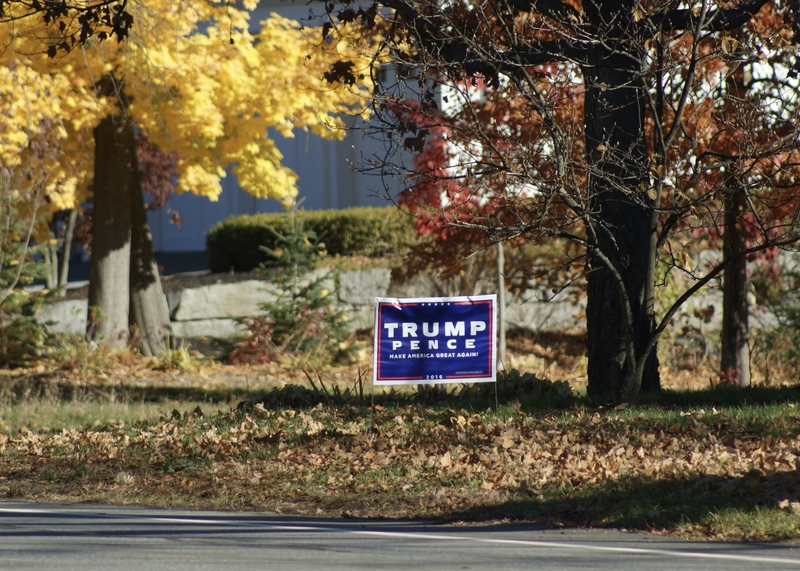 A year later, there are still some Trump signs posted, despite local ordinances saying political signs must be removed after an election. 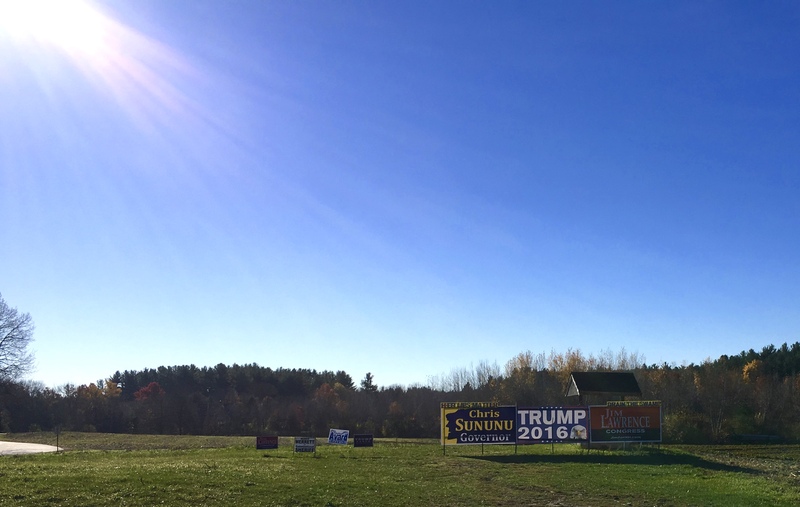 This New Hampshire sign, backlit by the early morning sun on Election day, marks the moment where I first felt that Trump might win. 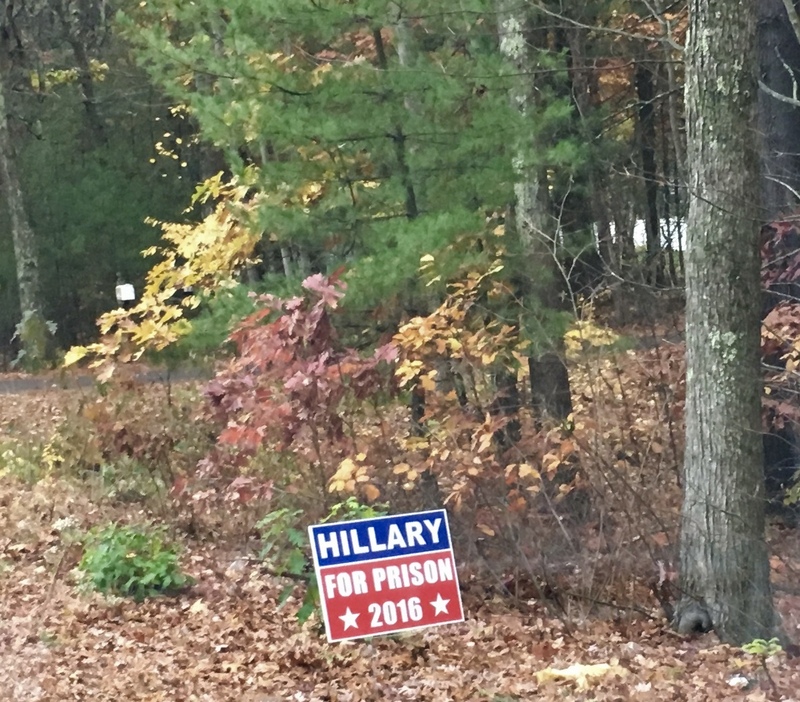 I had been driving down a road dotted with Trump sings and no Hillary signs and I had to pull over to get this shot. 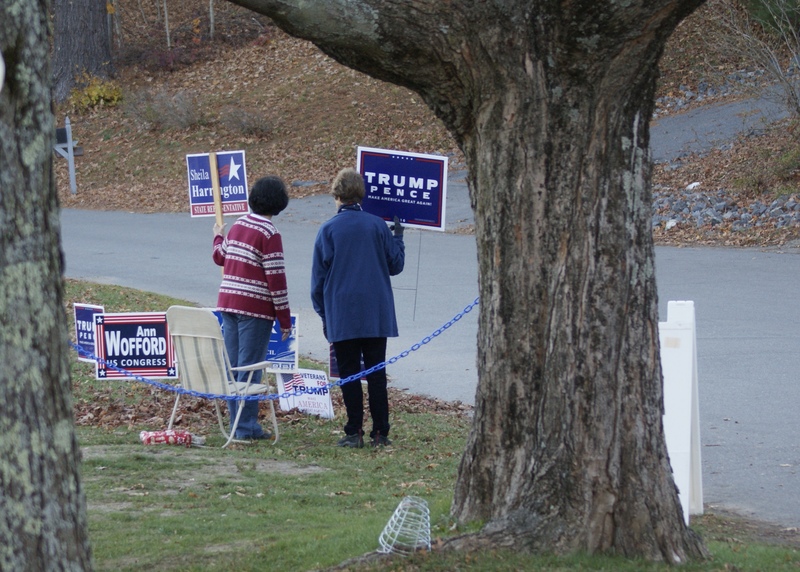 And then, at a local polling place, all of my shots of this group had this line through them. All of them. 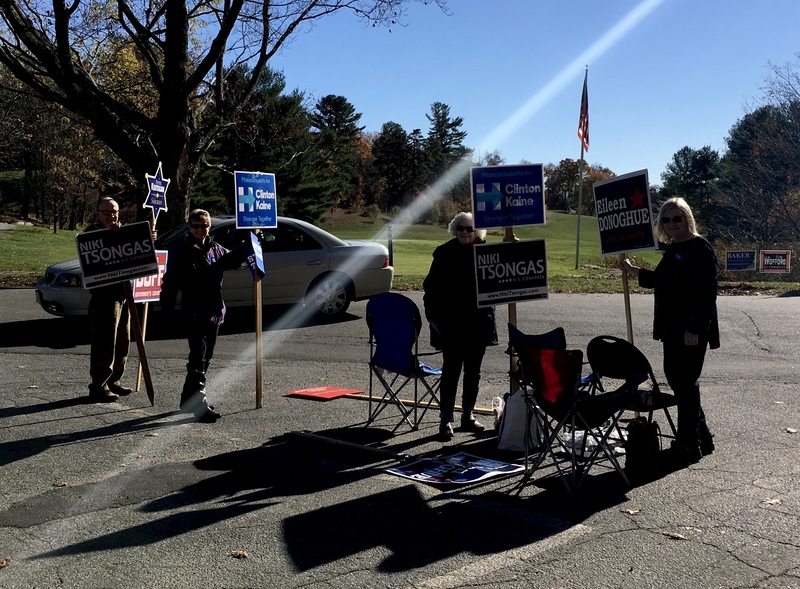 Over in the shade, at the same polling place, these steadfast women held their ground. 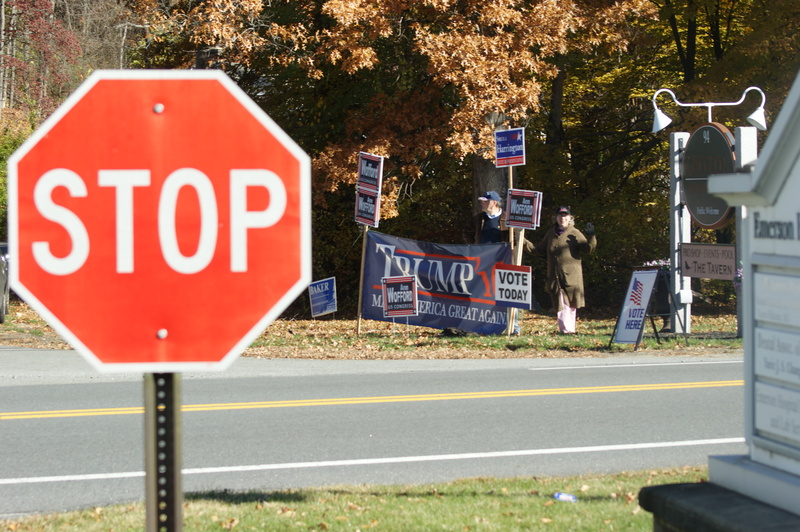 Out on the main road, Trump supporters dominated the entrance to the polling place. 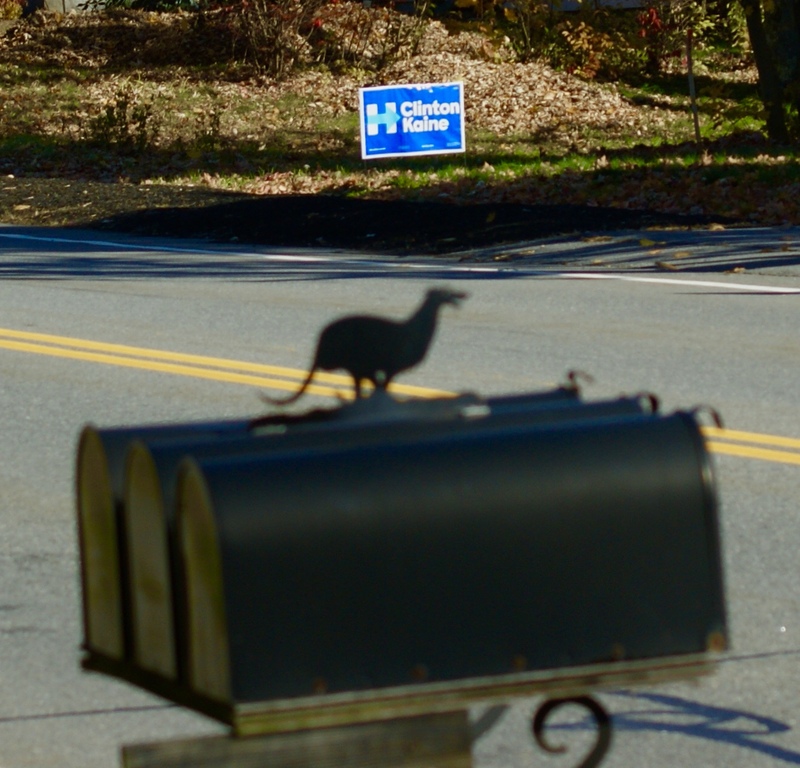 Again, Hillary won the town and the state, but you’d never know it from the signs. The beginning and end of our day – we started with cake and ended with booze. 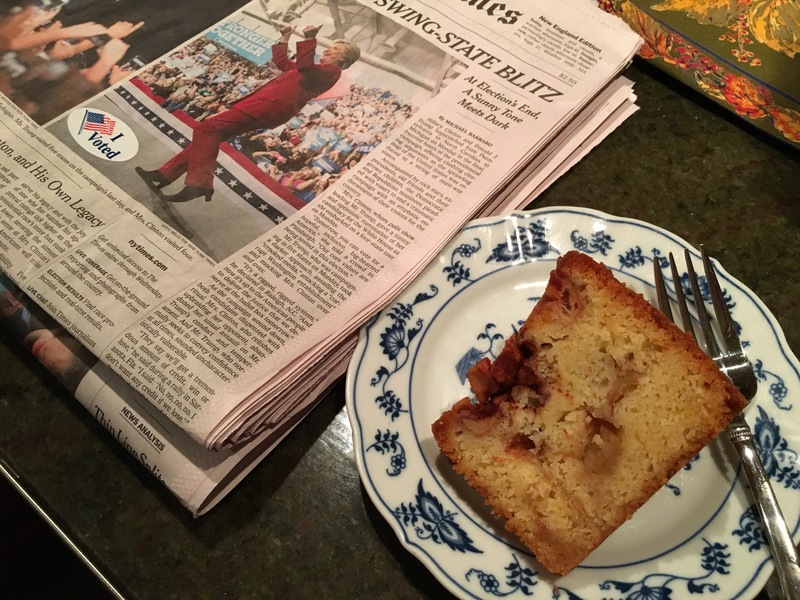 At one point while watching the returns – everyone else had gone to bed – I needed to stress eat so much I took Christmas cookies from 2015 out of the freezer and ate them. They were delicious, but needless to say they didn’t help. I watched all of the debates, read the news, and sat in disbelief that people could be diverted by Benghazi and email servers. 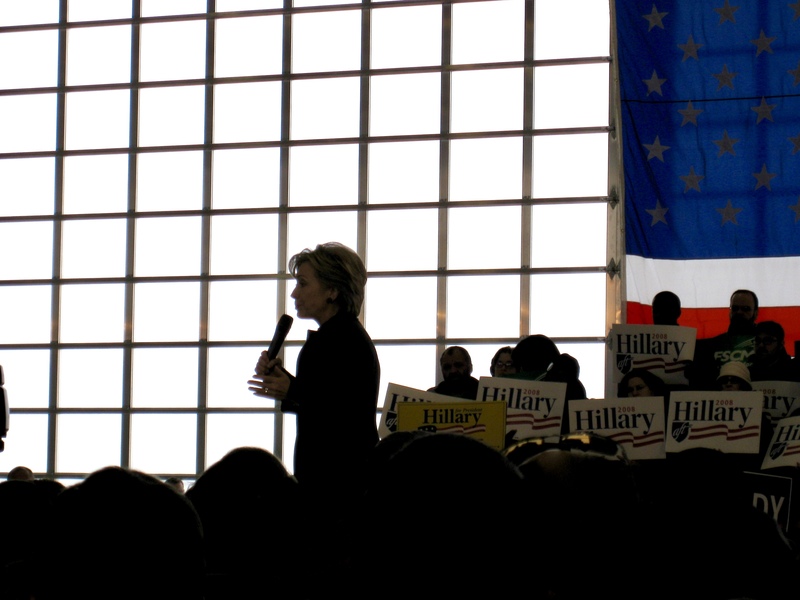 I was befuddled by references to Russia, annoyed by anything having to do with the Clinton Foundation, and furious with all the free media time given – without rebuttal or correction to the endless lies – to the Trump rallies. Bannon and Conway were admired for their Machiavellian brilliance with absolutely no understanding of what that might mean for America. Even though it has taken me a year to process the results of the 2016 election, I am no longer mystified by the reality of President Trump. There is no single reason for a success even he did not anticipate. If he really thought he would win, he and his associates would have hidden their ties to Russia better. I underestimated the antipathy of voters toward the Clintons (yes, plural) and the tone-deafness and sheer incompetence of the Democratic party. One need only look at the pitiful minimum wages and job losses in key states like Michigan to see that the Democrats lost touch with their base and did not take care of working class people at the state or federal levels. Whether Bernie Sanders could have solved that problem is a question that will be long debated but never answered, because he was never tested by the fires of a general election. The Weinstein scandal came too late to help Hillary, but there is no guarantee that wouldn’t have backfired, too. Bill Clinton’s harassment, perjury, hypocrisy, draft-dodging and perpetual obfuscation paved the way for Donald Trump to do the same things, only exponentially worse because he has surrounded himself by people who, like him, are morally bankrupt, scientifically illiterate and clueless about governing. Add to that the unanticipated mendacity of Mitch McConnell, Paul Ryan, Mike Pence and John Kelly – the “cooler heads” we kept telling ourselves would prevail in a Trump administration – and we are left with the too little too late types embodied in Jeff Flake and John McCain, whose political careers are effectively, almost tragically, over anyway. And so we are left with a leadership – and in some ways moral – vacuum in the Democratic party. Nancy Pelosi and Chuck Schumer had worn out their welcomes with the larger electorate by 2014, but their fundraising prowess obscured their lack of appeal to the next generation of voters, who were looking for a champion like Bernie and the only thing the democrats had to offer was…Bernie. Debbie Wasserman Schultz proved herself to be the Democratic versin or Reince Priebus – and somehow she got re-elected. Now, as in 2014, Elizabeth Warren and Al Franken are doing all of the heavy lifting. I haven’t read Donna Brazile’s book yet, but it appears she is owning the failures of her own party, and taking a terrible hit for telling it like it is – or was. Even if the Trump presidency does not last, the GOP line of succession still guarantees that moneyed interests will prevail over the common good. 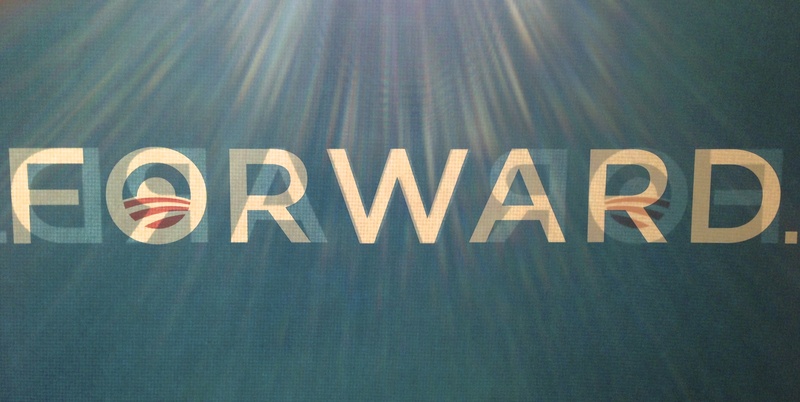 The Democrats still have not figured out who is a worthy successor to Barack Obama. The solution is maddeningly simple in theory: authenticity. It’s what Obama has down to his very fingertips, and what every major Democrat with a wide audience beyond but Franken and Warren lacks. Franken and Warren are the first to admit they are not the saviors of the party, but they do set an example for what a competent Congress looks like. It’s a start. We need a Bernie Sanders for the 21st Century or we could very likely end up reliving in the 19th century.